We have loved living and entertaining in our LEED Platinum, super-insulated NetZero home for the past three years, and it has exceeded our expectations. Since the 2016 tour, we have finished a bedroom, bath, wine cellar and working studio/shop in the lower level. 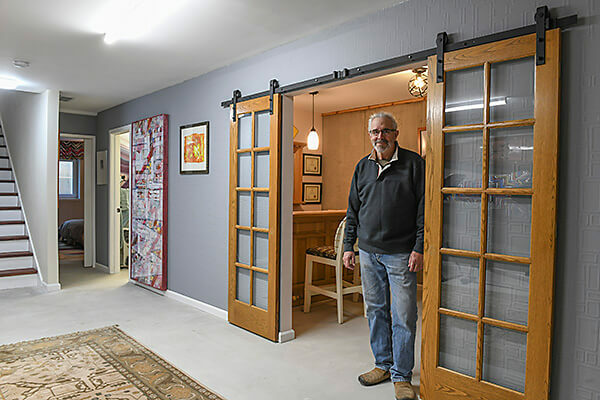 We’re bee-keepers now, too.The two-bedroom, one-bath open concept on main floor facilitates passive solar strategies consisting of heat from the sun in winter and a hyper mini-split heat pump providing supplemental heating and air conditioning. U.S.-made Passivhaus certified windows allow natural ventilation in the summer; north windows provide daylighting to bedrooms and bath; under-cabinet windows in the kitchen bring in great light, roof overhangs shade windows from summer sun. We have photovoltaic solar on the garage and a solar hot air furnace for heating the lower level. Home is on a hill.